Travel the scenic Apache Trail at the base of the legendary Superstition Mountains. Visit Goldfield Ghost Town where tales of gold abound! Gold was first struck here in 1892. Next, it's time for a relaxing steamboat cruise on one of Arizona's most beautiful desert lakes - Canyon Lake. Your cruise aboard the Dolly Steamboat will give you a chance to catch a glimpse of big horn sheep and bald eagles as well as learn about the Apaches from your boat captain. After your cruise, enjoy a stop at the "bustling" town of Tortilla Flat (population 6). 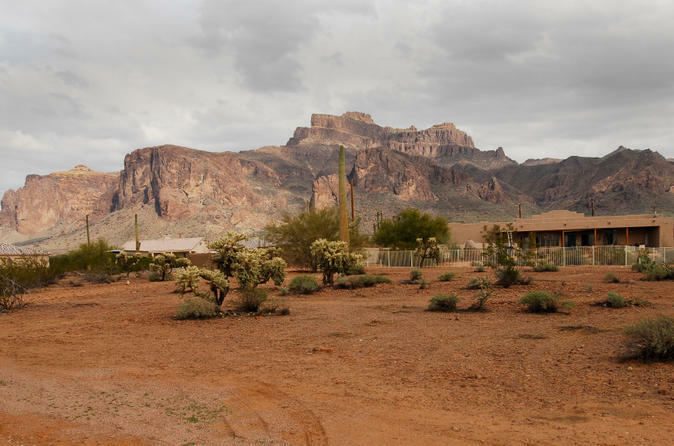 This small Arizona town is the last surviving stagecoach stop along the Apache Trail. A lunch stop will be made at either Canyon Lake Marina or Tortilla Flat. This tour departs on Thursday and Saturdays year around.